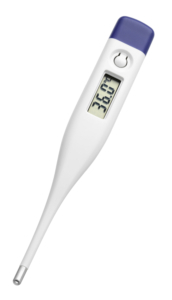 Body temperature can be measured in a quick, safe and accurate way with this electronic medical thermometer. The thermometer alerts you with a bleep when the measurement is done. It also has a memory to store measured readings. For quality assurance, it is tested to EU standard. A plastic protective case is included for the storage and safekeeping of your device.